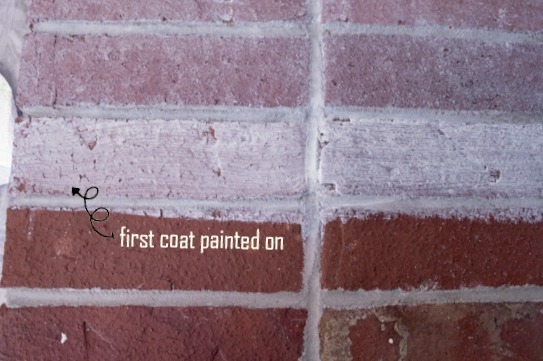 I Whitewashed Some Brick And I Liked It! So maybe Katy Perry’s boyfriend wouldn’t mind my latest paint brush victim, but the hubby was totally “Mhhh” about the transformation. Which sorta bummed me out; and then I got over it because I love it so. Guys! 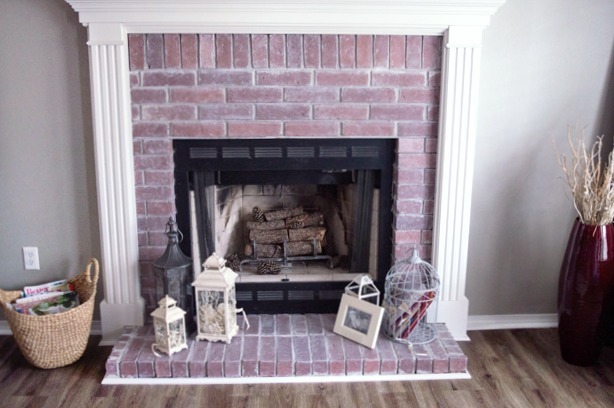 Check our whitewashed brick fireplace. Saturday, I finally broke out the paint and paintbrush to tackle a project I have been contemplating for 3 whole years! When we moved into our house and attacked all the walls with grey paint, I knew the fireplace was just too warm for the look I was going for. But something deep down in me liked the bright red of the traditional brick. That, and a fear of doing something permanent. I am trying to live by a new mantra this year, to be intentional. That means trying to figure out just what being intentional with my décor really looks like. That is a topic for a whole other post. One thing is certain, I have been trying to move in a more farmhouse/industrial direction and the warm tones of the red brick was just hurting that vibe. So I whitewashed my fireplace. Can I share with you how fun and easy this project was? Duh, that’s why I’m here. To get started, you’ll need to gather your essential ingredients. Any latex paint will due for this project. I always keep a quart can of Sherwin Williams ProClassic Interior Acrylic paint in my paint cabinet. You know for any trim touchups or cabinet scuffs. So I used this paint. I also grabbed an old Purdy paint brush. You can use a stiffer brush if you want fuller coverage, but I wanted the chippy look and didn’t care to get in every nook and cranny of the brick. 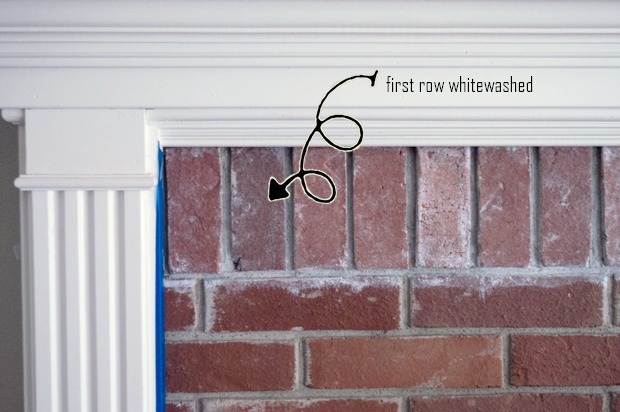 The key to whitewashing brick is your paint to water ratio. Most articles that I read while doing my research suggested a 1:1 ratio. I, however, wanted the red of my brick to bleed through more, so I went with a 1:3 water ratio. Make sure to mix it up really well. Cover and tape off as much as you possibly can that is exposed to the brick. Normally I don’t advocate the use of so much painters tape or tarp, but in this case, you’ll need it. 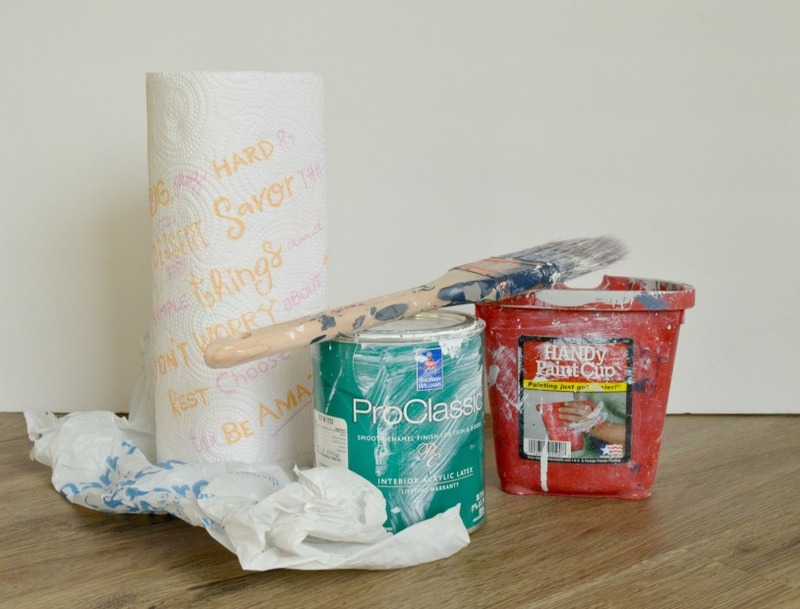 Your paint is super thin because of the water. I suggest you start on the side, just to get your technique down. And as is my case, to make triple sure that I wanted to whitewash my brick. The technique is quite simple. Load your brush and whip off as much as possible in your can. When you think you’ve unloaded it enough, whip some more. Trust me. 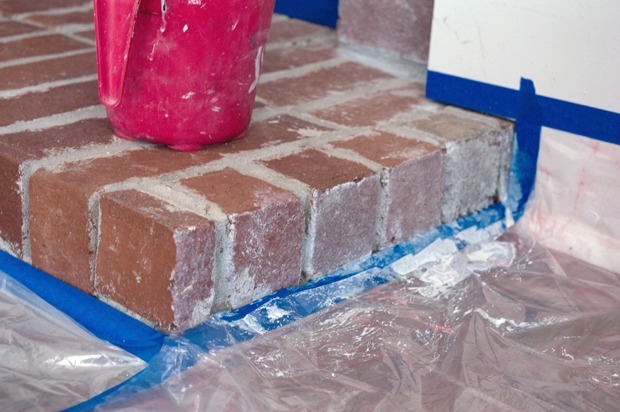 Start with painting the grout of your brick and then the brick itself. 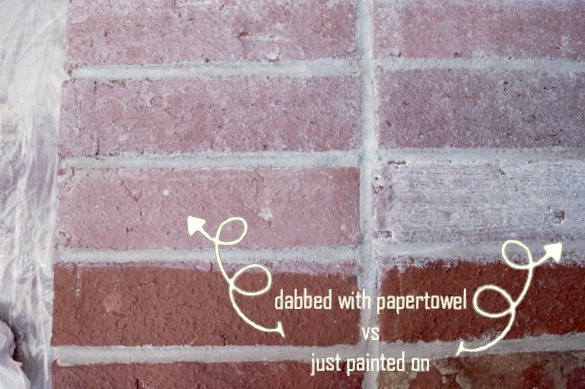 Use your paper towel to dab off the paint on the brick. I did the entire fireplace facing working row by row, dabbing with my paper towel as I went. 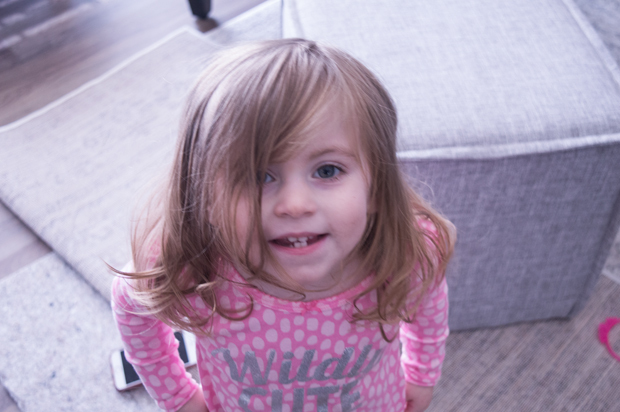 Then you stop and take a picture of your cute toddler because, well, she wants her picture taken. And then you start the second coat, this time just working along the brick. Continue to dab with your paper towel. 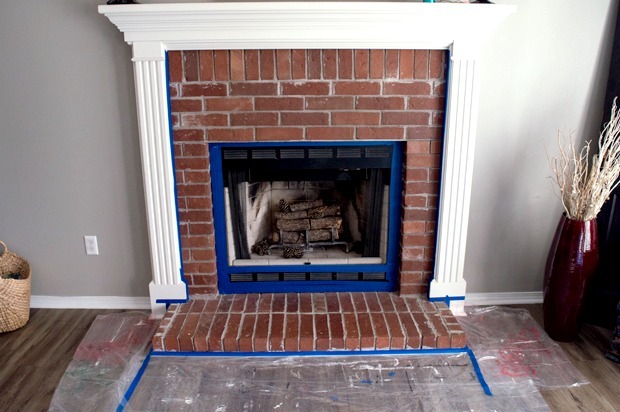 Once I finished the entire brick facing of the fireplace, I let it dry for several hours before I declared this project complete. 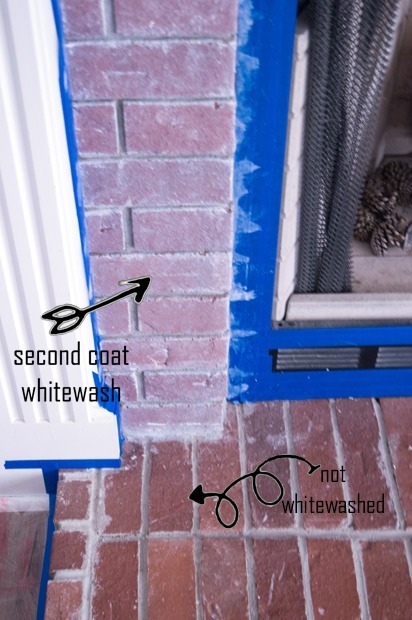 Do you have brick in your home that you’re itching to whitewash? I would love to see your projects. Looks great! 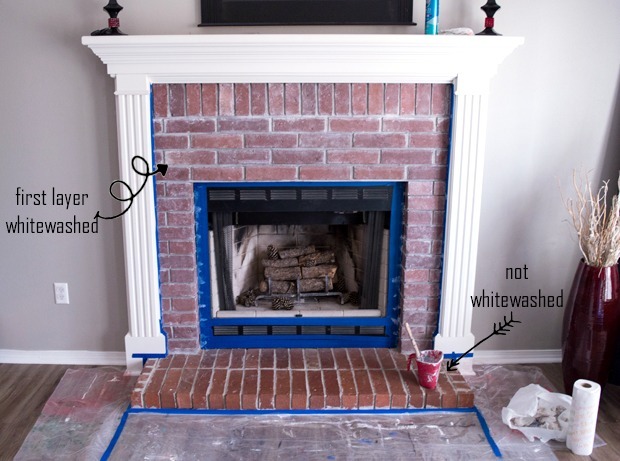 I have been tossing around the idea of whitewashing our brick fireplace. I need to try out a small not visible spot because I am afraid I won't like it and you can't just undo it! That was so me, but I'm super glad I did it. Thanks for stopping by. I love how this toned down the red of the brick! Great job! I would love to see the inside of your fireplace painted black to hide all of the soot. Where I live, all fireplaces have that done. 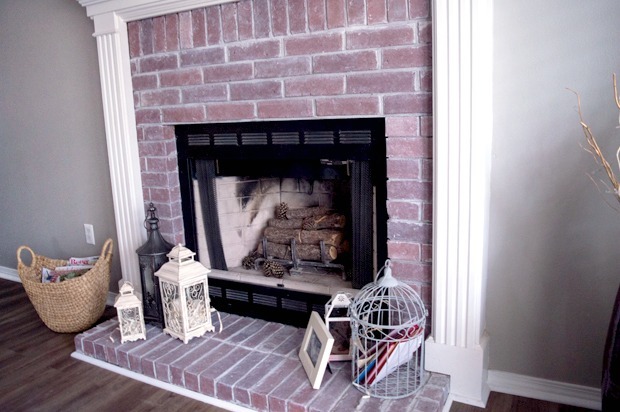 I love the toned down redness of the fireplace!